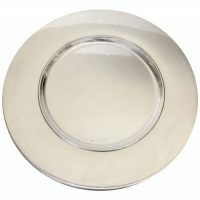 Home / Flatware / Silverware / Cutlery / Georg Jensen / Georg Jensen, Sterling Silver, Hand Hammered Plates / Chargers. Set Of 12. Georg Jensen, Sterling Silver, Hand Hammered Plates / Chargers. Set Of 12. 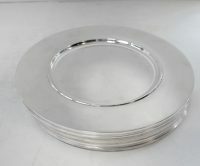 Georg Jensen complete set of 12 service plates No. 587C by Johan Rohde. 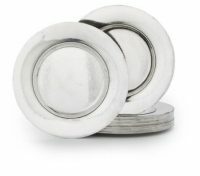 Each with a beautiful hand-hammered surface. 11" diameter. Total weight for the 12 is 7,875 grams. All are marked 587C, with various date marks.